4 What is The Best VPN Service? 16 Which VPN is For You? Internet security has become big news in recent years, with even major companies having been victims of hacking and theft of sensitive information. It’s not just businesses, however, that are susceptible to these problems. Everyone who uses the Internet is open to the possibility of identity theft, and worse, if they don’t use the best security features available. If you bank or shop online, or even if you simply use it for email, you need to be sure you have everything in place, especially if you are a user of public WiFi hotspots. With hand-held devices rapidly becoming the most popular method of browsing the net and even shopping online, public hotspots are becoming ever more popular and are available in cafes, pubs and even some shops, yet it is important to remember that a public WiFi hotspot is essentially an unsecured network. This means that anyone with the know-how, and it is not very difficult, who is on the same network as you could conceivably steal information from you, including your all-important passwords. So, what can you do about it? One way of protecting your identity and information when online is to use a Virtual Private Network, or VPN. We will explain more about how they work and what they do in a moment, but first, there is something more to a VPN than simple protection – they also have other benefits, especially for people who travel often to foreign countries or are working or living abroad. 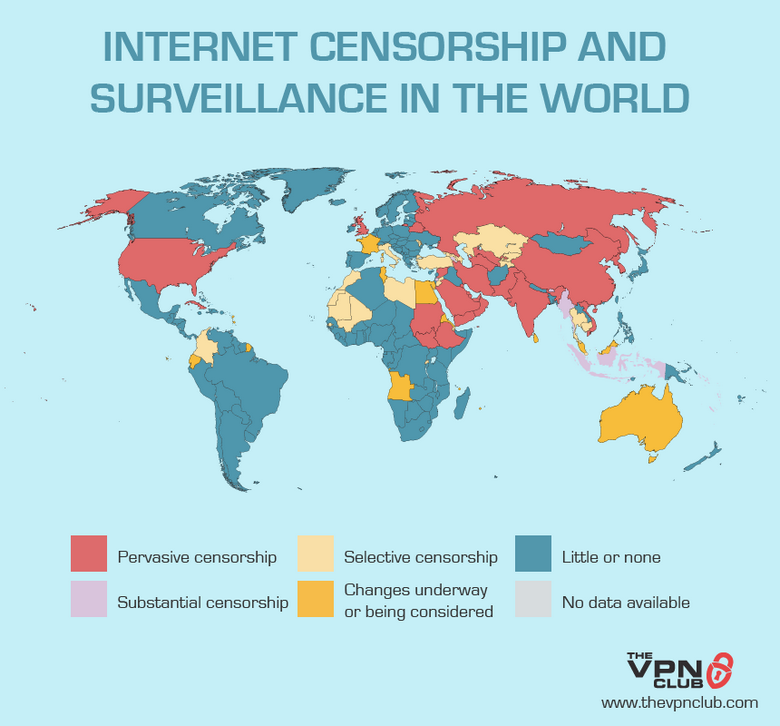 The reason is this: in some countries the Internet is not as freely available; countries such as China, Saudi Arabia, North Korea, and many others impose strict restrictions on what can and cannot be viewed online. They consider the Internet to be rife with content that is subversive or unacceptable for their citizens and, as such, use geographical restrictions to keep these sites from being viewed. This can mean that travelers abroad may not be able to access the likes of Facebook, Twitter and YouTube. As an example, China is probably the best, and the most well known. The government of China is very strict about what can and cannot be accessed within their geographical boundaries, as they believe western influence to be dangerous and influential on nationals in the wrong way. They implemented a scheme known across the world as the Great Firewall of China. This blocks popular sites such as Facebook, which the powers that be feel may be used by political dissidents to spread disinformation. However, it also affects visitors to the country in an adverse way. China is a major commercial power these days and many foreign students visit the country to get a feel for how it works. Imaging if you are one such and you find you cannot access your Facebook account when you get there. You can’t talk to your friends or leave statuses for them as you can’t access it. With a VPN you can choose a server outside the geographical restriction zone, and make sure you get your messages and experience home. So, a VPN can help you get around geo-restrictions, and it can even help you access content that may be blocked by censorship issues. You may have seen the script on YouTube telling you that the video you want to watch is not available in your country. Another country that has imposed geographical restrictions on many sites – especially social networking – is Turkey. Turkey, of course, is a very popular holiday destination, but did you know that Twitter is banned in the country? This means that, when you are on holiday, you can’t share your thoughts as you go about the day with your friends and followers. With a VPN you can overcome this, and it is quick, easy and affordable. One of the most popular video streaming sites is Netflix; however, your US subscription will not allow you to stream content outside the US – you need a subscription from the country you are visiting. This is an annoying problem – what if you are a frequent traveler in many different countries? You would have to sign up to several subscriptions, potentially at great cost. This can be easily overcome by using a VPN, for a single fee, rather than for several payments. So how do they do it? VPN software is not actually a complex idea, and nor is it one that takes a lot of effort to get used to. In fact, the best ones you simply download, pay the small monthly fee, and that’s it. That’s what we’d like to talk about next. A VPN is not as complex as it sounds at first. Although we are about to explain how they work, it is important to remember that, once you have downloaded the one you choose to go with, there is nothing else you need to do in order to use it. It will simply be there for you when you need it. So, what is a VPN, and how does one work? When you request or send information online from your home computer, smartphone or tablet your request will go to a server – the main machine, if you like – operated by your Internet Service Provider (ISP). This server will then talk to another which is linked to the information you need, and it will then connect you to the website concerned. The problem with Internet security begins here: the server is not as secure as it could be as it will be used simultaneously by many people who have the same ISP. This means your information is vulnerable. If you are abroad your request will go via a server in that country, and this is where the geo-restriction is applied. The server will know where you are by codes attached to your online identity, and if it senses that you are in a restricted country, your request will not be met. How does a VPN get around these problems? There are a number of factors that the VPN will use to both protect your identity and information, and overcome geo-restrictions on content. A good VPN service will guarantee all information you send across the Web will be encrypted. This is the first step taken to ensure your security. Also, it will use an IP address – the code that tells servers who and where you are – that is one of its own, rather than the one allocated to you by your ISP. This further protects your anonymity. Then there’s the subject of geographical restrictions: a VPN service will have its own servers in many countries across the world, and users are able to choose the one they want to use. Therefore, if you are in China and want to get through the legendary ‘Great Firewall’ you choose a server in the USA, Europe or anywhere that is not restricted. This effectively fools the system into believing you are somewhere other than your true location, and overcomes the restrictions in place. That’s the basics of a VPN and why you need to use one if you are worried about security online. For businesses they are essential as they protect potentially sensitive information, while for personal users – especially in WiFi hotspots – the benefit of online anonymity is too great to overlook. Next we will have a look at some of the best VPN services available, with information to help you see what you get from each one, and give you our verdict on the best choices. We have compiled the table below so you can easily compare the main players in the VPN market. The table shows the number of servers, countries, cities and IP addresses that each service covers, plus which platforms it is compatible with and the price per month at the time of writing. Following the table we have a summary of the details about the individual services, what we like about them, any pitfalls and further information that may be relevant to you. As the above table confirms there can be a notable difference between the cost of individual VPN services. Although each is relatively low in terms of outlay, across a year it can amount to a quite considerable difference. To help you decide which is best for you we took a look at each package and assessed its merits. Each of the leading VPN services makes bold claims as to its effectiveness, and while most offer a set package of features that will likely be similar to others, there are many stand-out details that make some more attractive than others. Most of the VPN services also offer a free option, but these come with limited usability. We have concentrated on the full paid version in each of the following brief reviews. The following are brief reviews of each of the above. VyprVPN offers a range of features including a claim to be one of the fastest of all, and it certainly performed to our expectations. However, it is something other than speed that makes VyprVPN attractive, especially when it comes to security issues. Most VPN services use servers that are operated by a third party; while they do guarantee a certain level of security it is clear that, with third parties involved, there is always a risk of interference from persons not associated with the VPN provider. Where VyprVPN differs is that it uses only servers that are in-house; in other words, all of its servers – some 700 in more than 40 countries – are operated by itself, and there is no third party interference risk. This, we believe, is a major selling point, and one that others should take note of. VyprVPN guarantees that everything to do with its service is handled within its own company, so has perhaps an unequaled level of security provided. At just $6.67 per month it is also competitively priced, and we would not hesitate in recommending it for a shortlist. CyberGhost boasts a number of impressive credentials that make it worthy of consideration, including more than 550 servers in a wide variety of countries. While not quite matching the sheer quantity of VyprVPN and HideMyAss this is still an impressive achievement, and with four million users so far it is a proven and effective service. CyberGhost offers a great level of encryption and anonymity is guaranteed, while speed is no problem and there is no slow-down thanks to bandwidth use. We found it easy to install and seamless to use, and it is a sensible package for using in public WiFi hotspots. Unlike many rivals this one can be used on a variety of devices at once – up to five in fact – and is also available for Apple and Android devices. It’s a very attractive package when all is said and done. One of the most popular VPN services available is Hotspot Shield, and we found it not only easy to use, but highly efficient and very usable indeed. Where it falls down somewhat is in having only a limited number of servers – only 6 at the time of writing – but nevertheless, it still provides excellent levels of anonymity thanks to effective encryption, guaranteed anonymity and fast operation. There is no slow down thanks to unlimited bandwidth, and as it is primarily designed for use in public WiFi hotspots it is perfectly optimized for both smartphones and tablets and works very well on both. Hotspot Shield promises users a masked IP address, which is of great appeal, and is simple to install. Where it wins, absolutely hands down, is price: just $4.16 a month is pretty much unbeatable, and we think it makes up for the lack of variety in servers and locations at least to some degree. Hotspot Shield is certainly worth putting on your shortlist. While there is no one area in which it stands out – bar the price, which we will come to later – boxpn is a perfectly good VPN service with a comprehensive range of features. Offering excellent levels of anonymity, full streaming services and guaranteeing no logging of personal information, it ticks all the boxes a goof VPN should. With more than 80 servers in 21 countries the network is greater than many and the company has many users satisfied with the service. We found it easy to install and use, effective in public WiFi hotspots and fast, with no slowing down and unlimited bandwidth. One claim made by boxpn is that its encryption system – 2048bit – is so advanced it would take a million years for a supercomputer to decode the data. Then there’s the price: for just $2.99 a month on a 12 month contract boxpn looks very competitive and is certainly one to consider on budget alone. Express VPN is another service that comes up with the goods without doing anything spectacularly original. That’s not to put it down – it is a perfectly good VPN with many fine features. With servers in 78 countries it certainly has a wide spread which will make it attractive for those who visit or live in geo-restricted areas, and it promises a good level of anonymity and security. Although 256bit encryption is not up to the levels promised by boxpn it is pretty much the industry standard, and should be more than adequate for users on unsecured networks. Easy to use and install and offering excellent speed, Express VPN wins in these areas but may fall down the order when it comes to price. At $8.32 per month it is considerably more expensive than some of its equally good rivals, but we would not advise against its inclusion on a shortlist of VPNs thanks to the large number of servers and locations it provides. proXPN is one of the more established VPN services available and while limited in the number of countries – just 7 at the moment – it is a worthy contender as it does offer some impressive credentials. Not least of these is the 2048bit encryption, a level that really cannot be beaten, plus anonymous IP addresses, unlimited data transfer, limited record keeping and a full range of connectivity options. It is compatible with both Apple and Android systems, is easy to download and set up, simple to use, fast and effective. We liked the fact it is very well optimized for users on smartphones and tablets – great for coffee shops with unsecured networks – and it ranks as a good all-round VPN service that you could rely upon to keep you safe online. The only downside is the price: at $6.25 it sits in the mid-price range, and while that is all very well, there are some serious competitors that come with a very similar price tag and, we believe, offer more bang for their buck. By far the most comprehensive coverage comes from Private Internet Access, one of the oldest of the VPN services with more than 2,400 servers worldwide. It promises the usual attributes we expect, including anonymity, encryption to a high degree, excellent customer service and the ability to jump over firewalls, and also claims to give the ‘highest quality at the lowest price’ in the market. When we consider what it has to offer, at just $3.33 per month for a 12 month contract this is not a claim to take lightly. The sheer number of servers and the company’s experience in the field makes it worthy of consideration but, and this is not a heavy criticism, beyond that there is nothing particularly outstanding. It’s an easy to use, well thought out and effective VPN service at a great price. The final one of our chosen VPN services is EarthVPN, another that has been around for some time. EarthVPN has a healthy 304 servers in 32 cities across the world, and provides all the attributes you would expect: decent encryption, online anonymity, ease of installation and use and everything else you would expect to find in such a package. At $3.99 per month it is also well priced, but it doesn’t quite match up to the one above at the same price which offers so much more. It’s a decent package but, in the company of those listed here, appears to be lacking somewhat in the overall scheme of things. Perhaps it is showing its age. So, the above are the main players in the VPN market; some have something special to offer, others are all-round packages that are perfectly capable and would do the job. Some are considerably more expensive than others, while some are remarkably well priced. The only way to decide on a VPN is to take it from those who know, and that’s what this review is about. Before we go on to tell you which are our winners from the above list there is one reminder we should add: no matter whether you agree with and follow our conclusion and advice, you simply must invest in a VPN. Whether you choose the cheapest, the one with the most fun name or one of those we recommend, your online security is not complete without a VPN, so please take heed and spend those few dollars a month for added peace of mind and more versatile browsing. Which VPN is For You? The above descriptions and table should give you a good deal of information regarding the benefits of each individual VPN, and further information about why you need one. Remember that the twin benefits of a VPN are Internet security and the ability to overcome geographical restrictions and, while all of these offer both of those attributes, some do the job somewhat better than the rest. Of course, price will always be a factor when deciding upon something such as this, but with so many services at similar prices it need not be the over-riding one when making the final decision. After all, value for money is about much more than the price alone: it’s about what you get for your money. With some of these packages being incredibly cheap – Hotspot Shield springs to mind – it may seem that the choice is a foregone conclusion. However, to make the decision so easily would be a mistake, as we have come to the conclusion that two of these services do a job that is notably better than their rivals. The first choice for us would have to be HideMyAss, and it wins for a number of reasons: it is well priced for such a great all-round package, and it offers a simply amazing number of servers, which really is a major scoring point when it comes to the effectiveness of a VPN. It’s not only the number of servers that makes HideMyAss a winner – in fact, we are more impressed by the fact it has servers in a quite incredible 151 countries. That gives this already impressive service a step up over any rival, as it provides quite outstanding reach and depth of coverage that will be difficult for others to replicate. HideMyAss is fast, offers excellent encryption levels, is well designed, easy to use and install, and does a simply superb job of protecting your identity online. The fact it has so many far-flung servers means overcoming any geographical restriction will not be problem as there will be a server somewhere that you can use successfully. At $6.55 per month there are many cheaper options, but we cannot see one that we believe, overall, to be a better deal than HideMyAss when it comes to a top class, fully functioning and reliable VPN. Our second choice, and it was a clear second, is IP Vanish, one of the most established and popular names on the market. IP Vanish is very similarly priced to HideMyAss – there are just a few cents difference – and also provides a very efficient and effective service. 140 servers in 60 countries is impressive enough although falls short of its close rival, but most do. It’s strong point, and one that will appeal to a broad range of users, is the ability to stream video to anywhere in the world, so no more blocked YouTube, Netflix or other streaming services. Easy to use and install and with no side effects such as used up bandwidth, it easily ranks alongside HideMyAss as one of our top recommendations. What about the rest? All are perfectly capable VPNs, but some – like Earth VPN – we find it hard to recommend for the reasons noted in the descriptions. Some are extremely cheap – Hotspot Shield is indeed very good value if budget is your driving force – and it is your choice as to which you choose. However, we are confident that we have picked the two that are the best all round value for money in terms of performance and features. Online privacy has always been a problem, and it is perhaps more so now than ever before. Not only have hackers become more adept, but there are more people using the Internet for banking, shopping and communications. As we talked about earlier the rise in the use of mobile devices – smartphones and tablets – has played a large part in the increased worry about Internet security. These devices are extremely capable – the latest smartphone can probably perform faster and more capably than a laptop of just a few years ago – and are very handy when on the move, which brings us right back to public WiFi hotspots. There is no doubt that public WiFi hotspots will play a large part in the future of Internet use. They are found all over, in pubs, bars, restaurants, cafes and even shops, and are becoming a necessity anywhere people stop to eat, chat or simply take a few minutes rest. They are very convenient and widely used, but they are extremely susceptible to attack from unscrupulous persons. If you are on the same network as someone and they have a simple, easy to obtain software package on their device, they can quite simply hack into your device, and even get past your passwords. This leaves you vulnerable in many areas – bank accounts, credit and debit cards, shopping accounts and emails are all accessible – and things are not going to change anytime soon. Why is this problem prevalent? Quite simply, because for a public WiFi hotspot to be truly public it needs to remain unsecured. It is not just a recommendation that you use a VPN on a public network – it is something that you must do in order to be sure your personal information is as safe and secure as possible. So much information about us is out there – online and ready to be accessed by those who know how – that it can be frightening to think about. We treat this abundance of online information – some of it personal and sensitive – with a lack of care and attention; we leave it often exposed, with easy to crack passwords and a lack of security. Even the most diligent among us are guilty of this: it’s easy to do, we lead busy lives, we don’t have time to keep an eye on everything all of the time. The problem is, as the digital world marches forward into more areas of our lives all the time, so we will find ourselves even more vulnerable. For example, where once you maybe had a computer at work, you likely mow have a laptop at home, a smartphone, a tablet, and perhaps games consoles with Internet access. All of these devices are equally vulnerable, and the future is going to bring us even more ‘connected’ devices. Put simply, the problem of online security is never going to go away, but with a VPN you can ensure you have the best possible protection at all times. We have covered the topic of Virtual Private Networks quite comprehensively above, but there is another type of online protection you can use. It’s called the DNS service, and it works in a slightly different way to a VPN. Where a VPN works by creating a sort of information ‘tunnel’ through which all your information is delivered, a DNS service – sometimes referred to as a Smart VPN – does it differently. What it does is physically change your Domain Name System (DNS) which is a system that tells websites you are allowed to access them. This has some advantages over the VPN; a DNS service will never slow your system down, but some of them may not encrypt your information and hide your IP address. We hope this guide has helped you understand the need for a VPN and allowed you to find the right one for you.